Get a reliably strong broadband and WiFi connection throughout your home or office with our BT routers. Just plug into your phone socket to hook up to your broadband network, then you can share a solid WiFi connection with all of your devices, including your PC, laptop or Macbook, Smart TV, smartphone and tablet. If you want to get online at home, without the hassle and tangle of cables, a good router is essential. 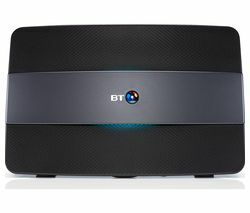 A BT router makes it really easy to connect to your broadband network. Smart Setup means you can plug in and connect in seconds, without the need for a PC or laptop. Featuring four Ethernet ports and a USB port, BT's latest router, the BT Smart Hub, allows you to connect any way you want. With seven built-in antennae to cover your entire home, you'll enjoy more powerful WiFi. Using dual-band technology operating on 2.4 GHz and 5 GHz, BT routers can switch between bands so that you're always connected to the strongest signals. Smart scan checks the performance of your hub and network connection while in use too. If it picks up any problems it discreetly reboots and establishes a fresh connection. Sharing files from a shared drive connected is quick and easy via the USB 2.0 port, and remembering passwords is a thing of the past thanks to one button pairing that allows you to connect new devices instantly. AC and MiMo WiFi give super-fast wireless speeds for all your devices at once, and advanced interference filters prevent your signal from dropping out. For more ways to connect multiple devices take a look at our full wireless router range and our wireless adapters that help to boost your wireless signal at home.